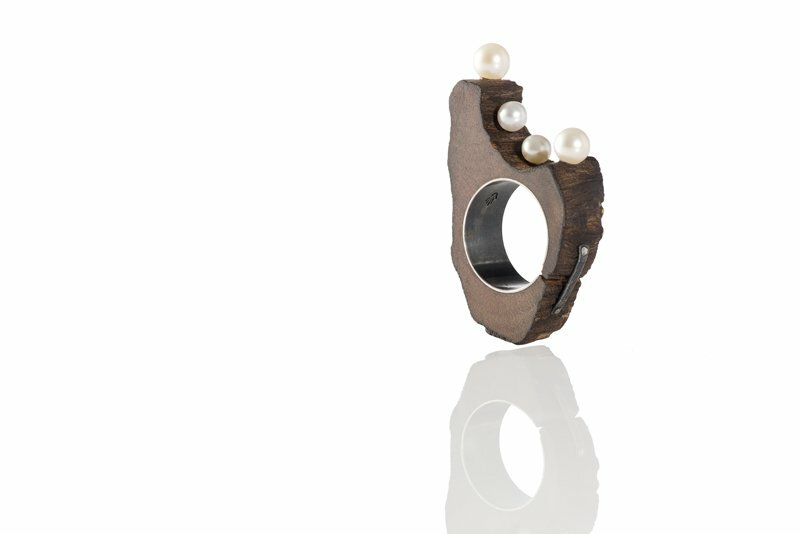 All proposals for this edition show a great adhesion to the concept, while never betraying the specificity of their research: Angela Ciobanu (Bucarest-Romania, 1984) inverts the perspective of the jewel from being a body ornament, an object to exhibit, to being an integral aspect of the psychology of the wearer, conferring memories and experiences whi- ch become exclusively his or hers and no one else’s. 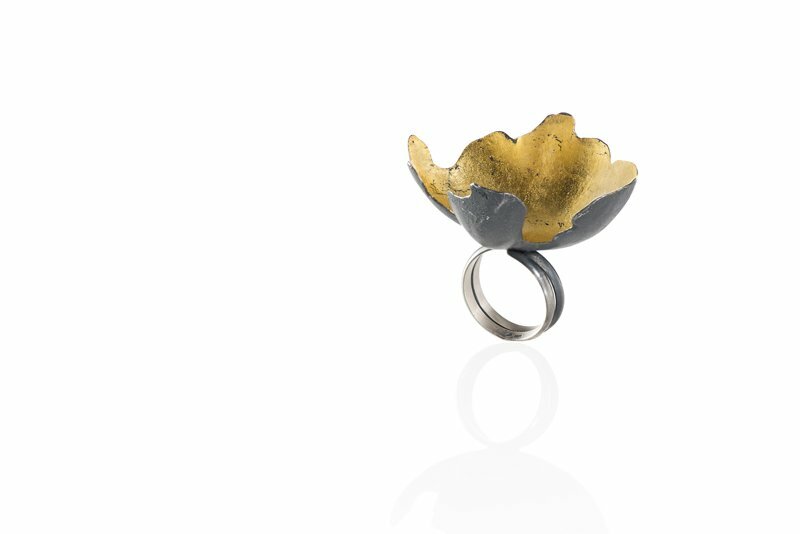 Non ti scordar di me = Forget me not (realised with delicate materials, like recycled silk, in order to underline the fragility of memories) is a talisman of memories, a secret pact with the wearer, an accomplice of emo- tions, a private language. 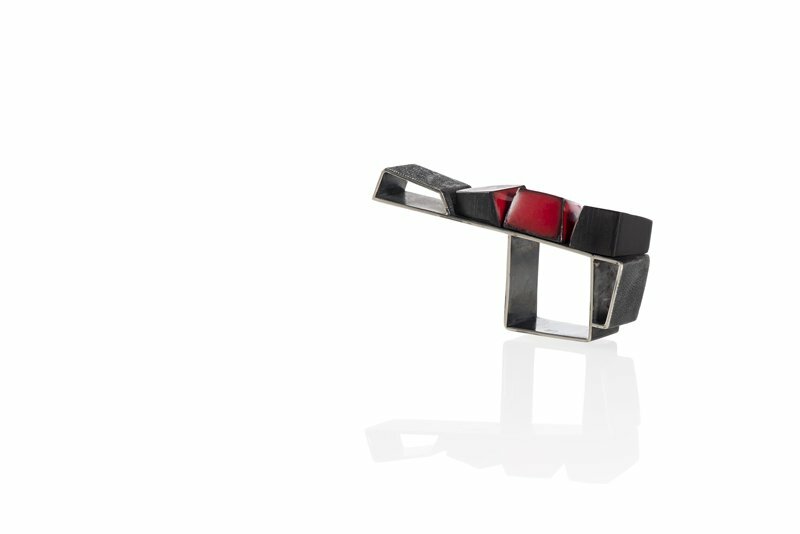 A 360° artist, Renata Manganelli (Turin-Italy, 1968) came to the world of jewelry along a winding but coherent path, in which her expressive potentials always knew how to contaminate each other in harmonious ways. 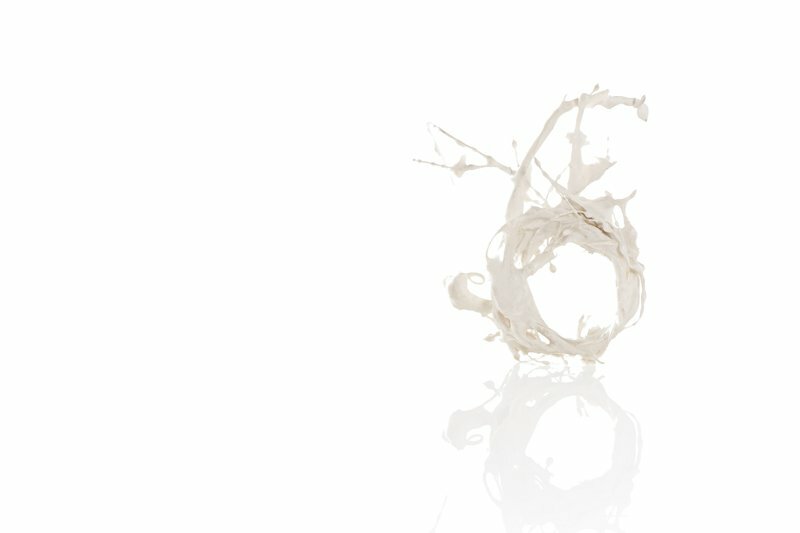 With her work Ossimori, she tends exactly towards the harmony of contrasts, both in conceptual expression and matter (porcelain and bronze in lost wax casting, organic and inorganic matter), and even in the final fruition of the object as being worn and/or purely decorative. 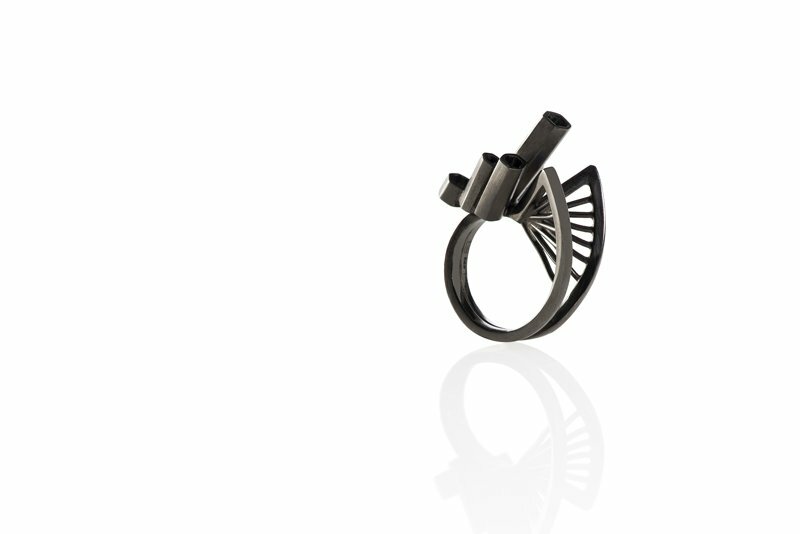 Her ring becomes an accomplished artifact, a spatial volumetry of aesthetic and functional autonomy, whatever its use. Correctly denominated a meta-sculpture, metamorphosis in fluid transformation, it even comes with a container sculpture, according to the desire of whoever places it in the space around him/herself. Metamorphosis, this time of Nature, is the research theme of Mabel Pena (Buenos Aires-Argentina, 1958), who is focussed on the use of natural materials, in this case the loofah plant, originally from Asia, from whose fruit sponges are made. Racemes which soar in the air, ascending to reaffirm the selfregenerative power of nature itself: elevation, growth which becomes totemic presence, poetic affirmation, primitive force. 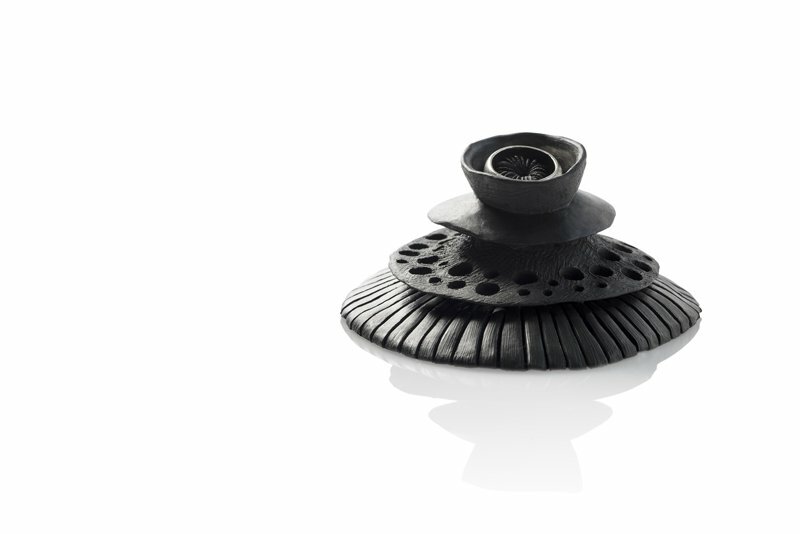 Shape, knowledge of an ancient technique like origami, matter, and even the chromatic aspect: everything for Lital Mendel (Holon-Israel, 1979) becomes an instrument to create a container of memories, like the old pendant-receptacles which in various cultures can be chests of precious elements, and, by extension, of memory. The Japanese culture is a conscious choice, since it embodies high manual skills at the service of complex concepts, not free from emotional implications as poetry or nostalgia. For Nikolai Balabin (Leningrad-Russia, 1955), technique is the conceptual junction of his research: casting sand becomes a metaphor for life. The artifex relies on processes that are close to divination, reading fate through chance, unexpected solutions, dizzying potentials multiplied in a universe where chance determines the outward appearance, and consequently essence itself. Quotations of constructivism, deep architectural culture, visionary qualities at the service of an idea: to Nicole Schuster (Gelsenkirchen - Germany, 1981) the place becomes topos, concept; the bridge becomes the passage, uniting and reclining, in this case on the hand. The body becomes the landscape. 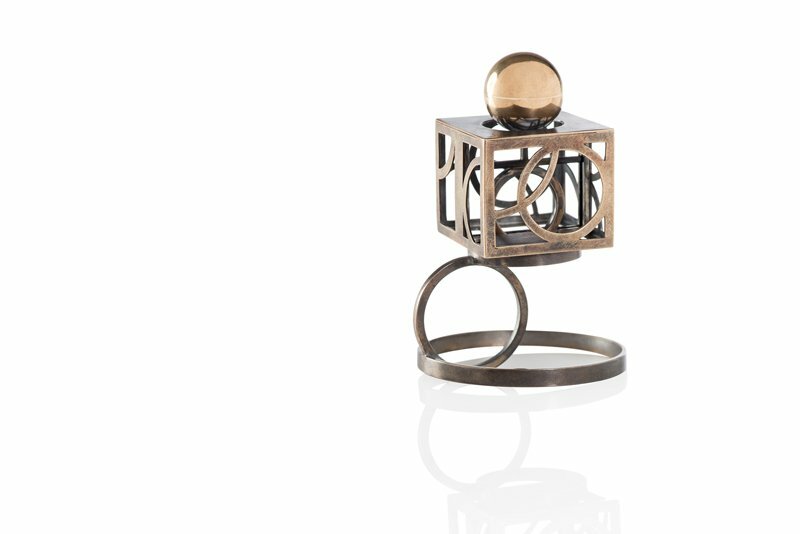 When not worn, the ring with its small organ pipes, is elegantly reminding of ascension and its opposite, enhancing the platonic idea of the bridge as a symbol of connections, both physical and mental. 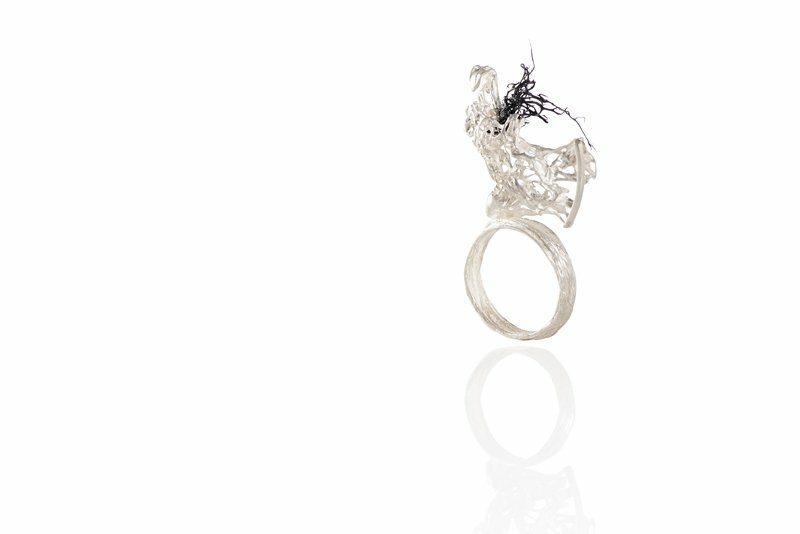 Rafael Luis Alvarez, (Buenos Aires-Argentina, 1959) puts himself in relationship with the visible and invisible worlds with a solemn and dreamlike attitude, and builds with his pieces a wearable cosmogony which relies on names of ancient divinities. Gea, in fabric and rubber, is to be placed in a much broader vision, in which the goddesses of the Earth, etheric figures, are evoked through a very personal language, variously declined on the fingers: a light and new presence in space. 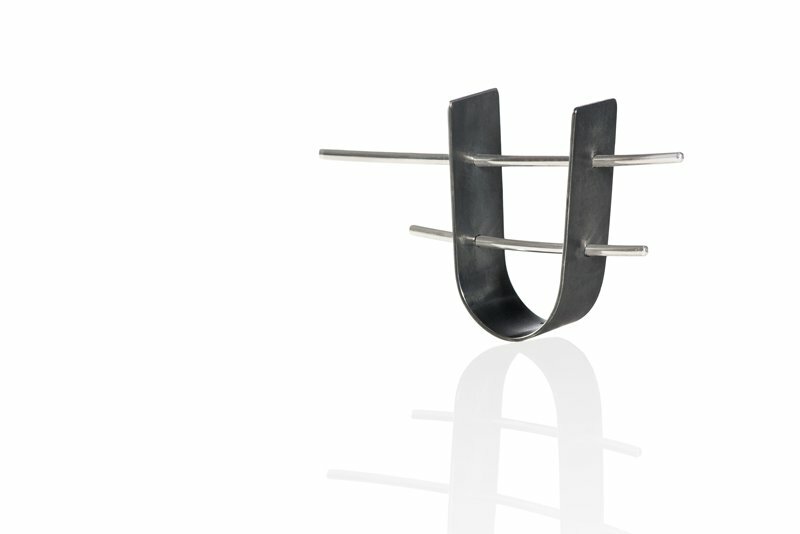 Nicolas Estrada (Medellín-Colombia, 1972), in the series called Spring, elevates wood to a noble and austere material. The choice of a tree connected to his Colombian roots, the Comino Crespo, totally reflects the spirit of the artist. The perfectly proportioned sculpture that becomes memory, also be- comes symbol and nostalgic feeling, intended as a return to the origins not without visio- nary imagination: thoughts germinate brilliant pearls, perhaps tears, perhaps dreams. Liliya Milpetrova (Kazanlak-Bulgaria, 1981) carries out a refined design operation, in which the aesthetics of modernism is deconstructed and rethought in an ironic manifesto with surreal strokes. 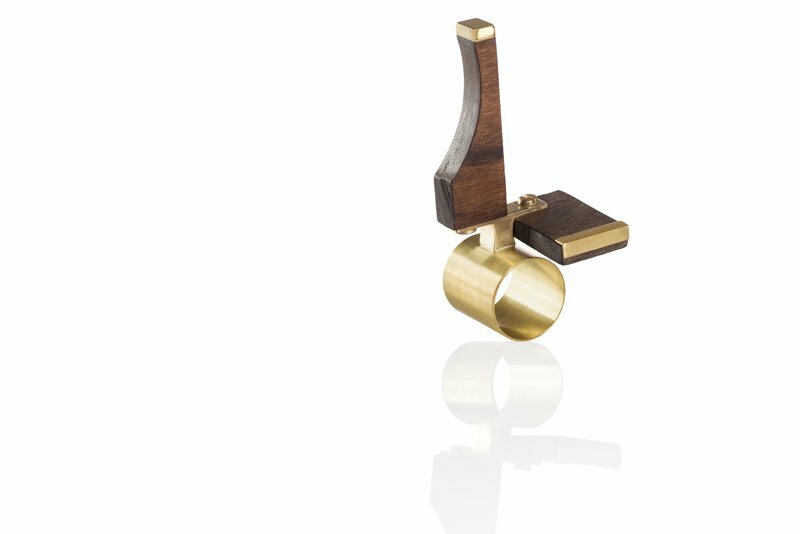 Materials such as wood and brushed bronze are organised in compositional modules, which bring to mind the furniture of the '50s and give the ring, absolutely unisex, a compositional rhythm which lifts it from any functionality, returning it to pure design. 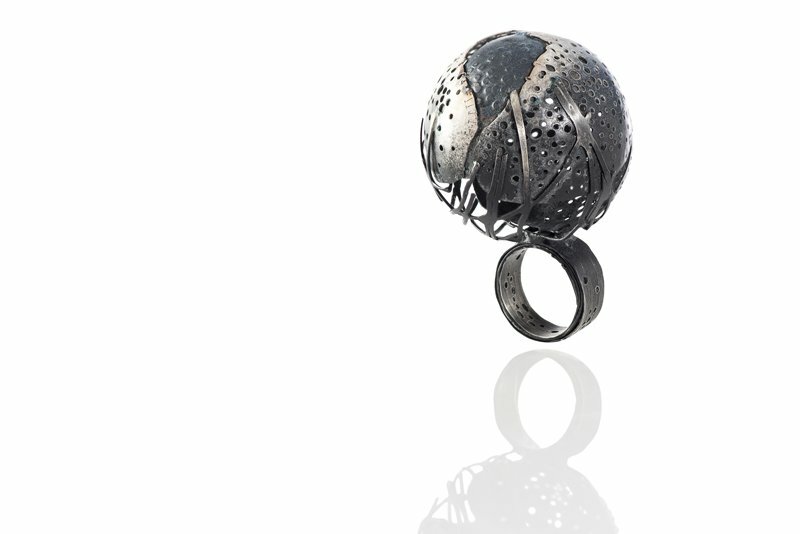 Stenia Scarselli (Volterra-Italia, 1968) reuses parts of an old piano to give life to a new object, imaginable on a bigger scale, difficult to interpret as a ring if not worn, but rather as an abstract sculpture, rendered aerial by the upward thrust. There is a perceivable energy in the compositional devising, in the choice of contrasting chromatics, in the playful association to a trampoline, which is also the work’s title, to a medieval walkway, to a redemptive passage. 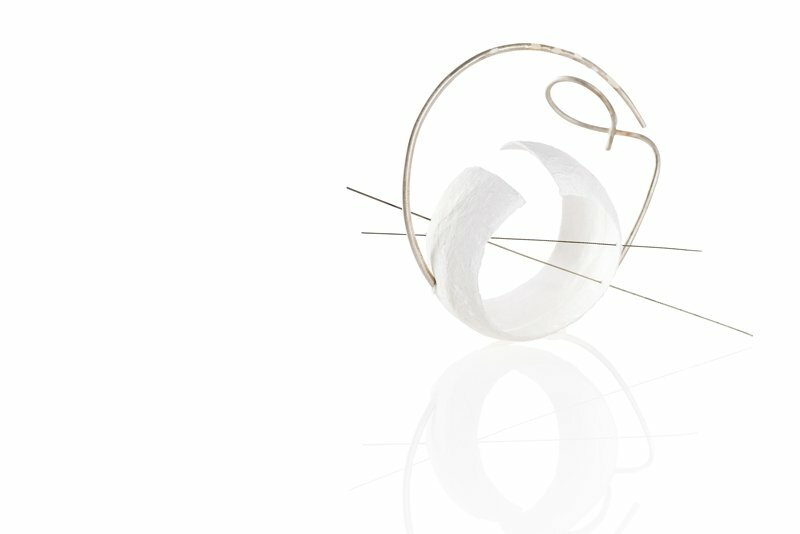 By choosing to counterpose two geometries, two polished and rigo- rous metals, Laura Forte (Copertino-Italy, 1982) expresses her willingness to realise an innovative shape, spotless and essential, autonomous and accomplished in its essentiality, which refers to certain balances between exterior and interior, inherent to oriental cul- ture and minimalistic taste. A conscious playful approach marks the research of Marco Malasomma (Caserta-Italy, 1968), who treats matter with a nonchalant lightness, up to the point of creating a magic box, almost a mechanical gadget where geometry, purity of lines and technical wisdom coexist with a certain taste for divertissment. 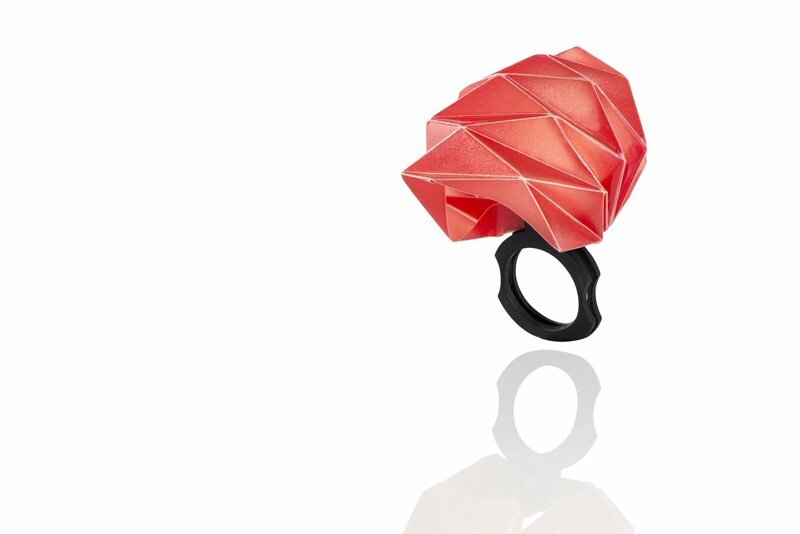 Anna Król (Cracow-Poland, 1983), gives life to an object of great sensitivity, a ring magnet for thoughts and emotions an experimental technique in service of an idea. A sphere which closes in on itself, letting its content shine through without revealing it, as if endowed with a life of its own, autonomous from who created it, yet still an accomplice. Contamination of languages, technical wisdom, narrative, ability to excite. The jewel can and must be all of that. If that would be the question, harmony would be the answer.